The Scottish Football Blog: Whatchu talkin' 'bout Willis? Reason for the post title? Well, none really. 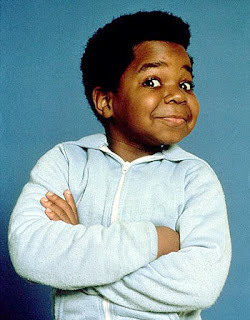 Although diminutive sitcom giant Gary Coleman does share my birthday in real life. And also so I can explain that last week's holiday was spent, instead of blogging, watching Eggheads. In one episode that very catchphrase formed the basis of a question. Which I, of course, got right. But then I did once have my name printed in Look-in's birthday column alongside that of the aforementioned Mr Coleman. Anyhow I'm back now with a preview of the big game (feel free to blame the mindless wittering above on my nerves) and this quick catch up. What have I missed? Well a full weekend's football. My brother got married on the 29th of August and my best man duties included, alongside the naturally spellbinding speech, a seemingly never ending round of pre and post prandial refreshments. So Hearts' fightback in Europe, Rangers' romp against Hamilton and Celtic's win at Easter Road pretty much bypassed me. I missed 137 year old Bobby Geddes taking to the bench for Dundee and coming close to playing. And, of course, I missed young Aiden's dive and Mr Mowbray's somewhat myopic, hypocritical defence of him. Although it did not take Mystic Meg to predict that a Celtic player would dive in the immediate aftermath of Eduardo and the whole sorry Emirates hoo-hah. Anyway, that's where I've been. Tonight I'll be in the front of the telly. Cheering, sighing, holding my head in my hands and, hopefully, jumping up and celebrating with all the energy that this cold/possible swine flu will allow. More soon. Or follow my thoughts on the game at Twitter.